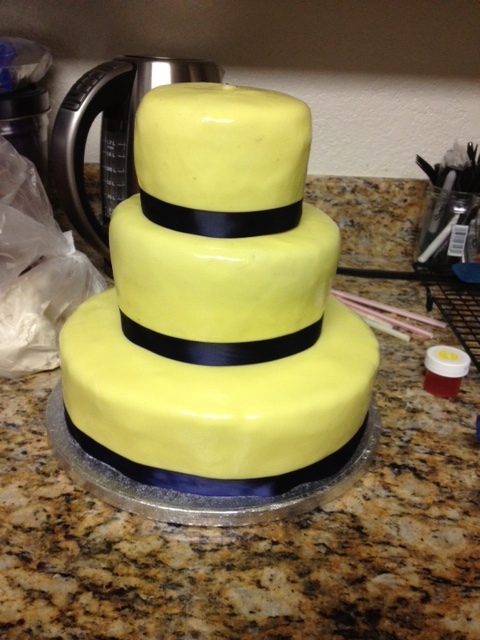 Here is the base- a cheery yellow! 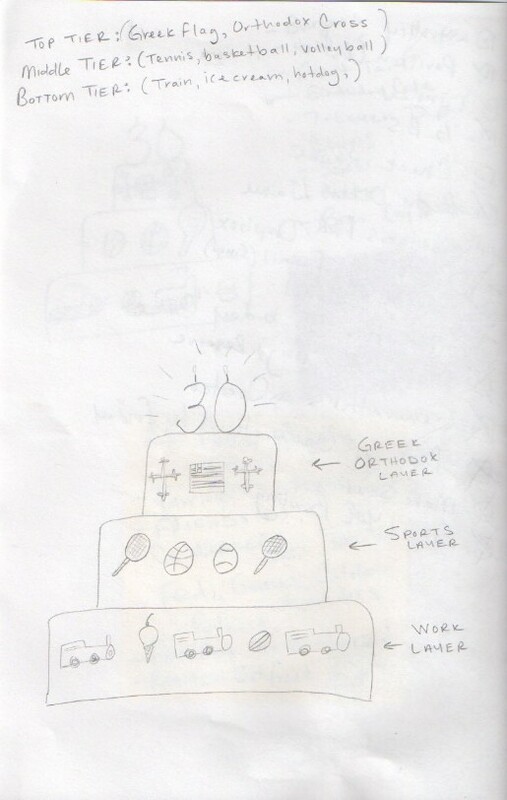 The tiers are chocolate, half and half, and vanilla. 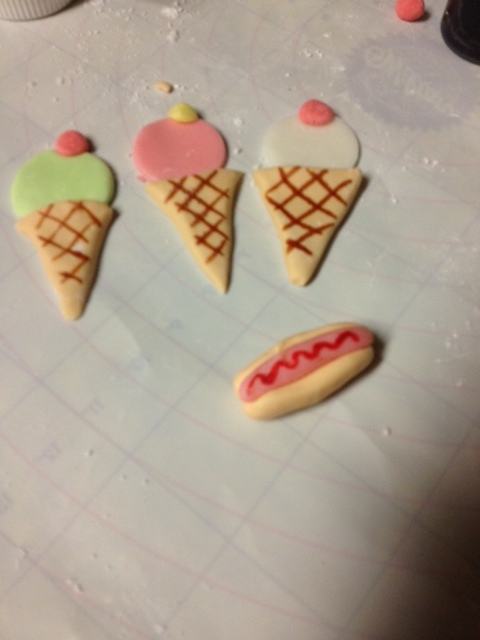 Ice cream cones and hot dogs! 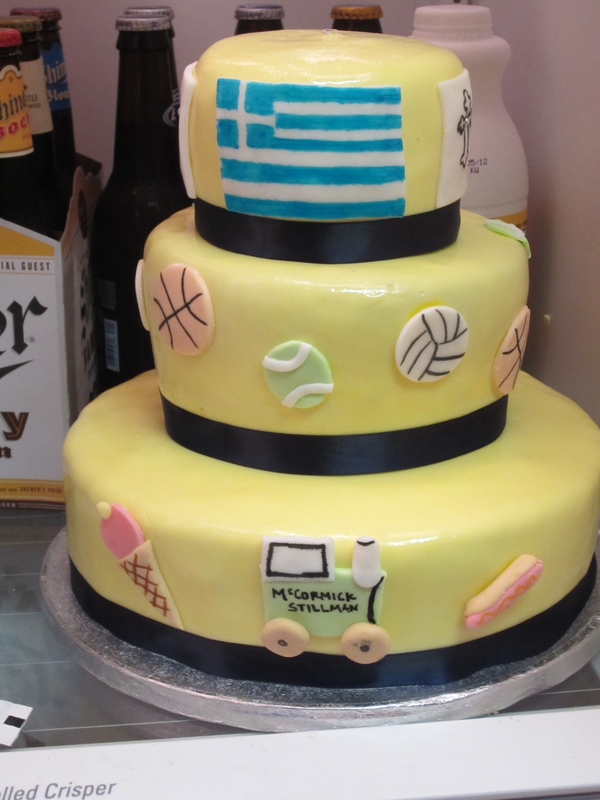 A Greek flag at the top symbolizes her cultural heritage. Opa! It’s baby time! Well for some people. Anne and Tony were expecting their first bundle of joy (he’s already born now) and she had her baby shower in July. 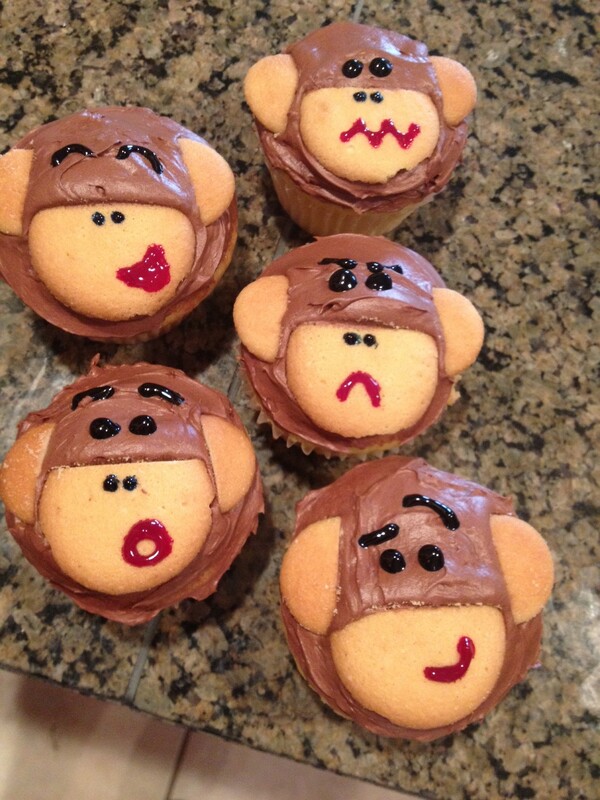 They prepped their baby’s room to be monkey themed, so instead of doing something super baby-shower-esque, (i.e. 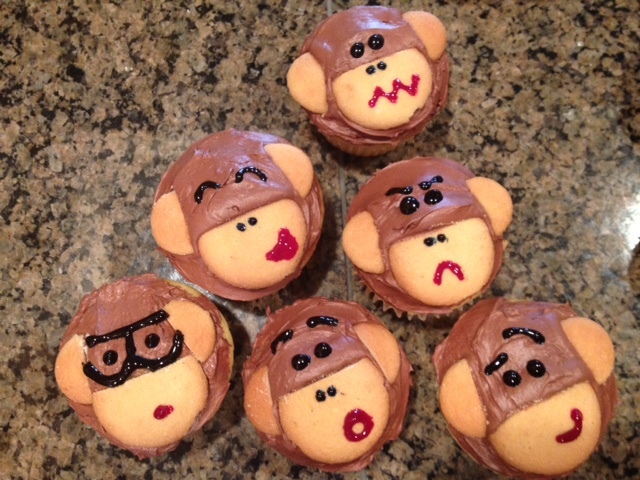 pastels and baby shoes and all that), we decided to do monkey faces on cupcakes. We started doing just the normal smiles, but it turned into a game to see what kinds of different faces and personalities we could give these guys. This was the first time I learned of mini-nilla wafers. Who knew? Happy Birthday to me! 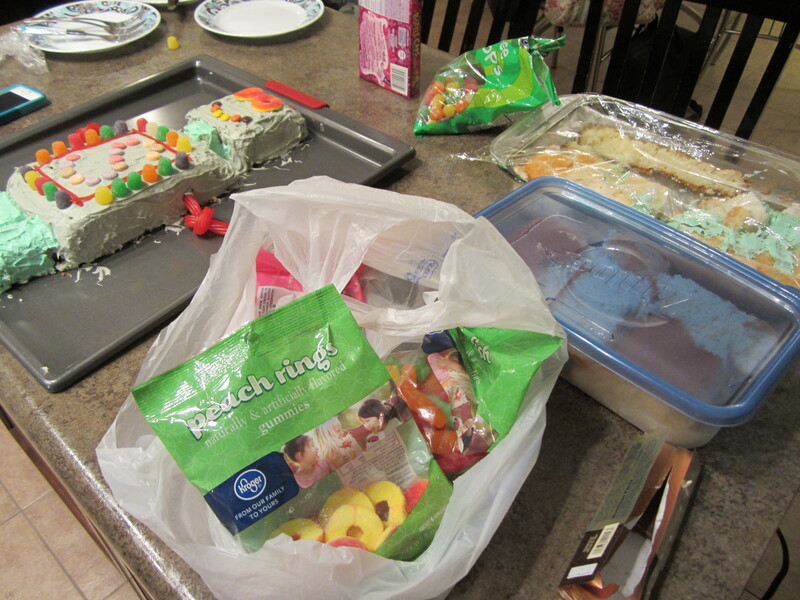 Haha, my birthday was in July, so I wasn’t caking this time! Megan and Matt cleverly and thoughtfully put together my new buddy Dexter… I have a secret obsession with robots and pirates and dinosaurs. I guess it’s not so secret now. Clever use of bottlecaps… Old school, I like it. The S is for Steph! 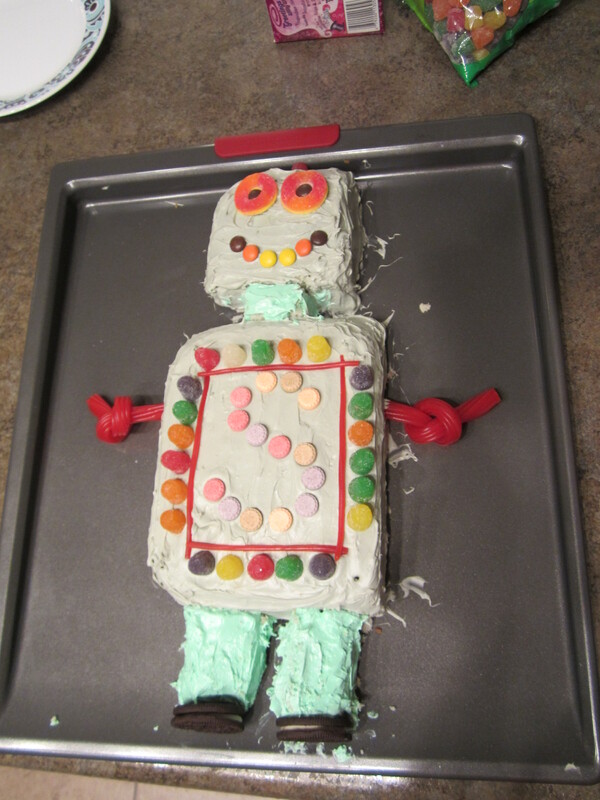 I also liked his little arms made out of licorice. Sorry Dexter. . . 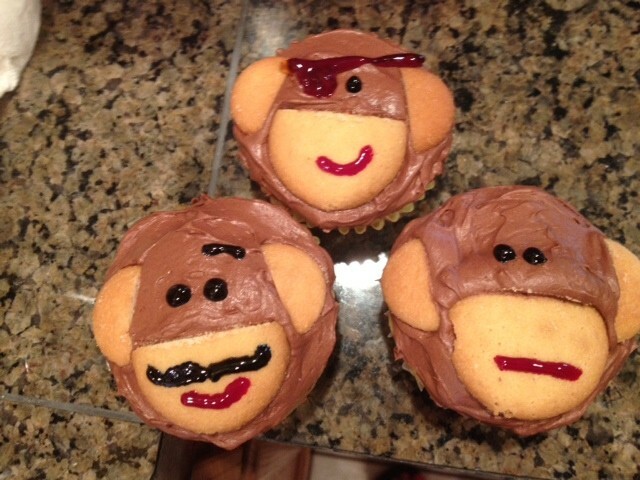 I will add that the spice drops were… interesting tasting. 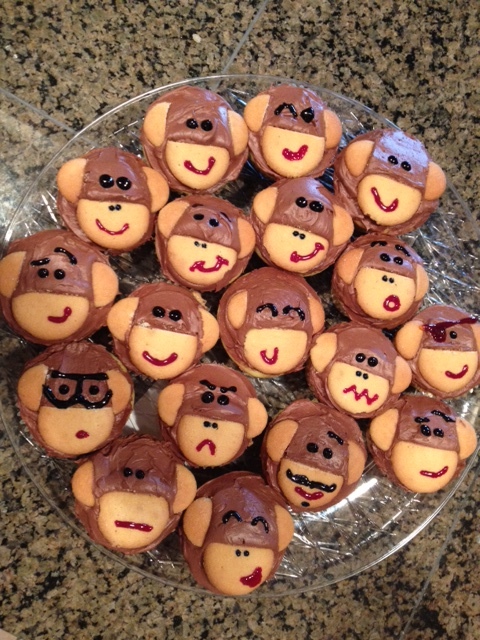 Bri’s little cousins and extended family came into town in June… so what better to welcome them with than cupcakes? 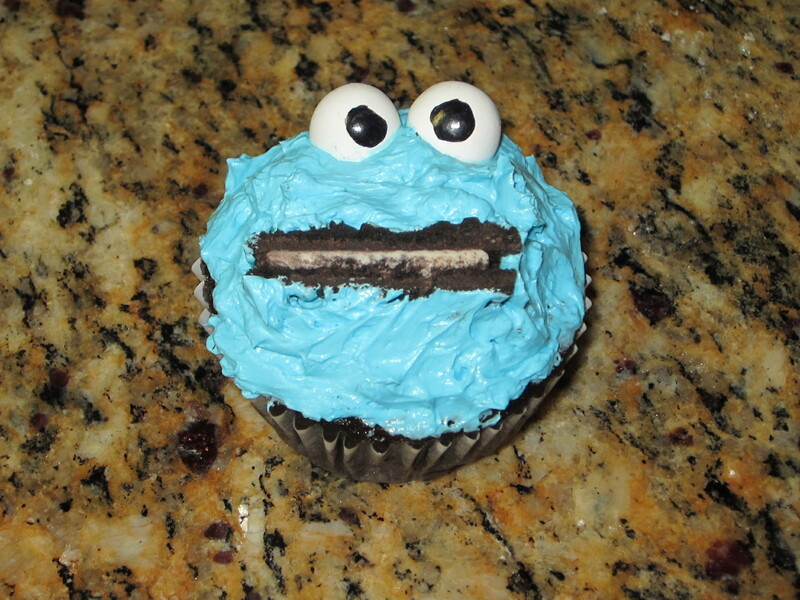 I forget how this inspiration came about… but we ended up doing Cookie Monster cupcakes. 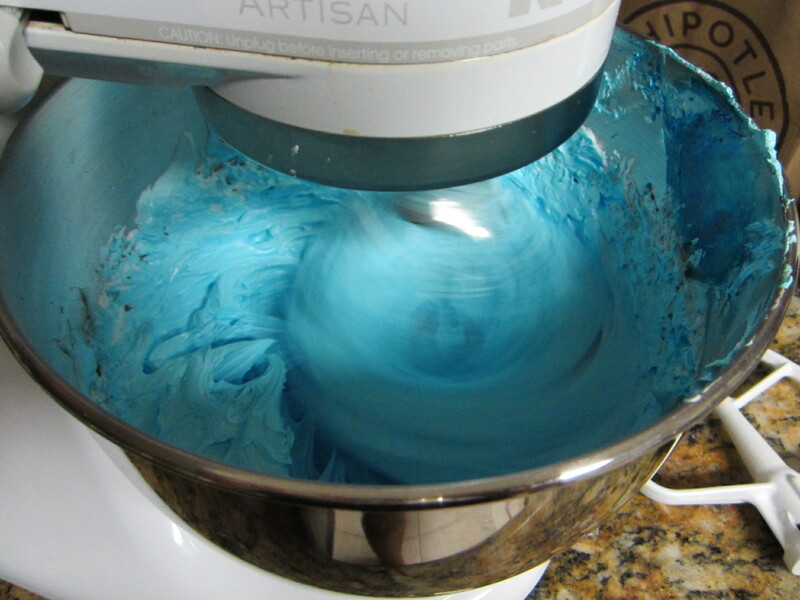 Here’s the blue buttercream… the bluer, the better! 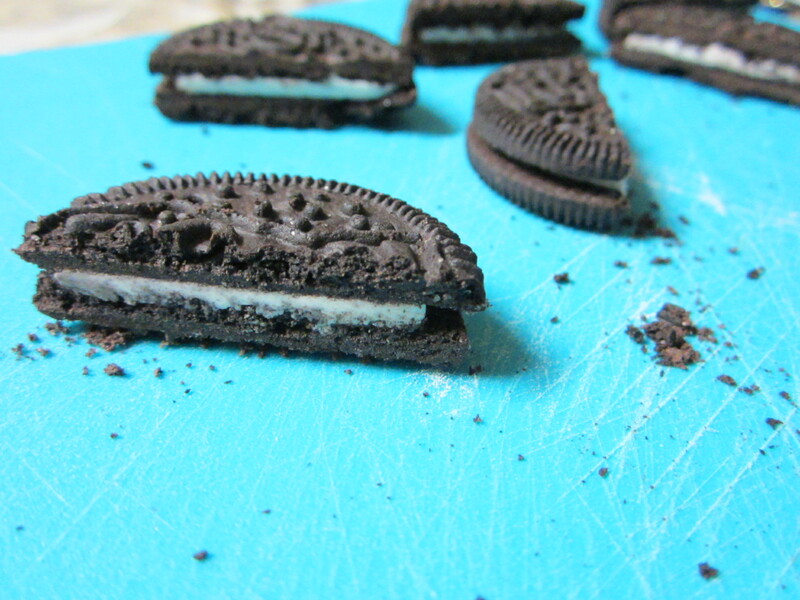 Oreo halves make for tasty and decorative mouths. One cookie monster down. We found these generic chocolate candies covered in white candy shell and just drew eyeballs on them with edible marker. 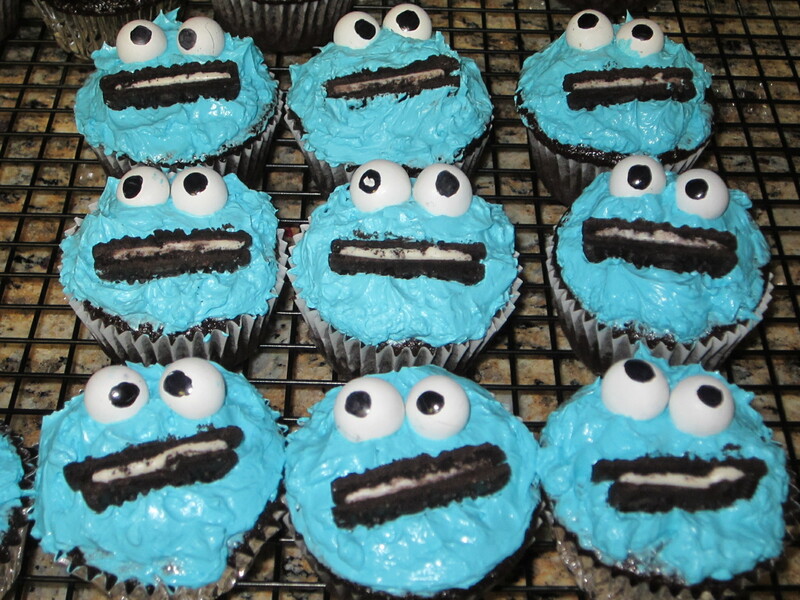 An entire sea of cookie monsters!!! 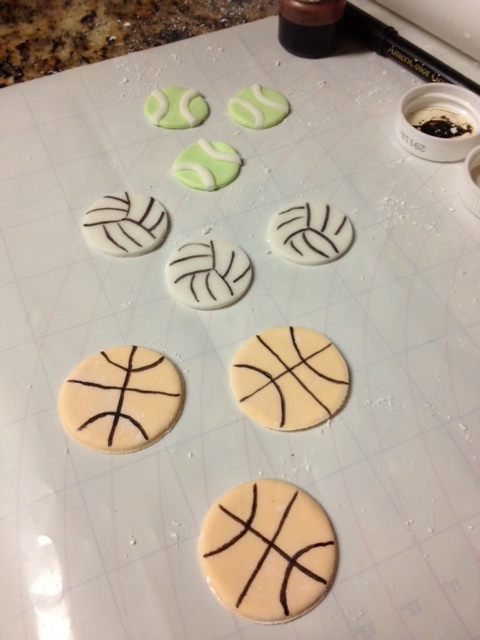 I’m seriously behind on posts and have gotten a bunch of “friendly” reminders… this is my attempt to catch up! 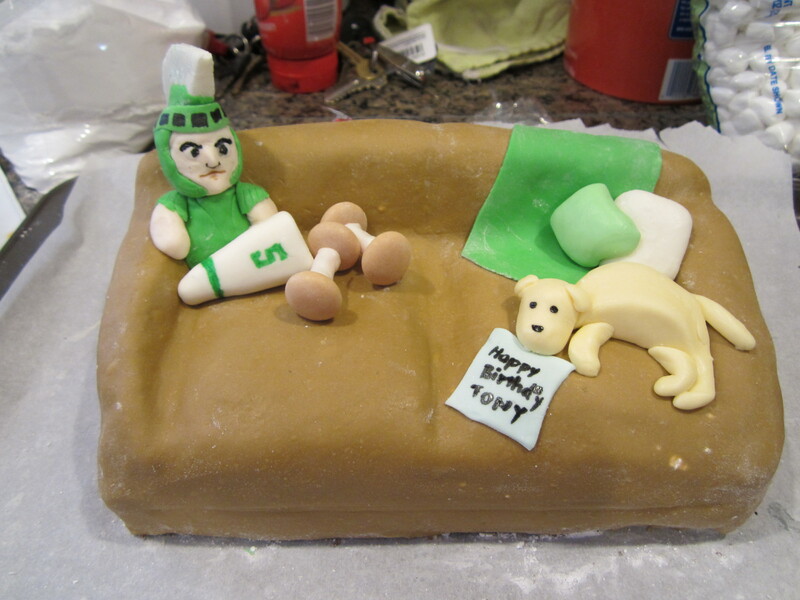 This cake is from March for one of my friends Tony. 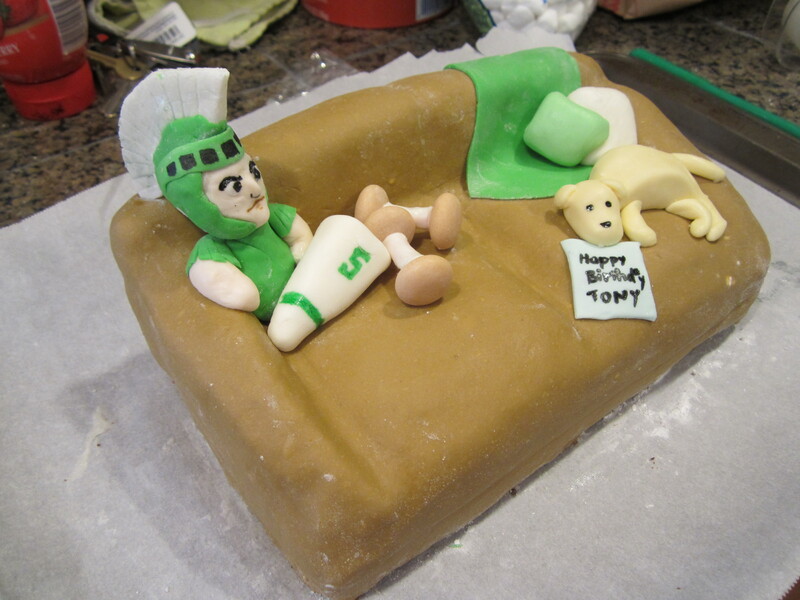 There’s a long story about how he lived on the couch of one of our friend’s houses for months at a time, and he’s also a loyal MSU Spartan. 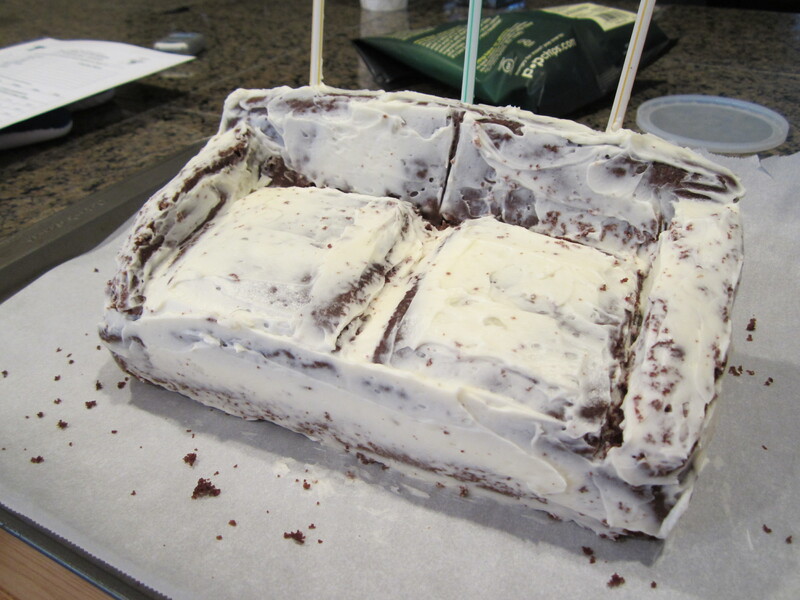 So I made the couch and added a few personal affects. 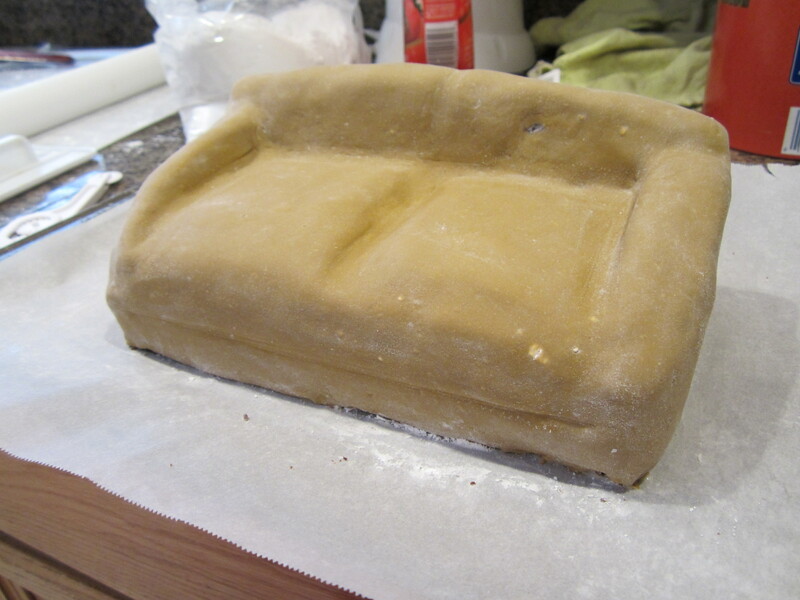 Here’s the “naked” couch, sans fondant. Three straws were the support structure for the back of the couch. 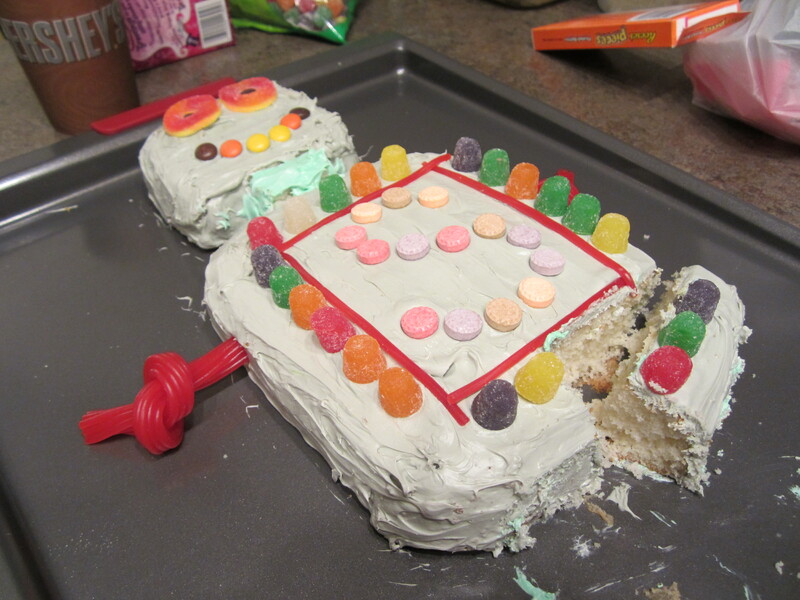 I sculpted a mini Spartan torso, Spartan megaphone, some dumb bells (fondant and Coke mentos… did you know they made cola flavored mentos?!!) a few pillows, blankie, and of course, Champ, the resident golden retriever.